Located in Vancouver’s business district, the Financial District is the home to many office buildings and the headquarters of mining and forest product businesses. The area is also home to offices of different non-for-profit organizations and federal agencies, consulates and overseas missions as well as top end hotels, law firms, accounting and financial companies, international and domestic financial institutions, and more. The Bank of Montreal and the Bank of British Columbia were the first Canadian institutions to open doors in the district in 1888. Their offices were located downtown on Hastings Street. Two decades later, the district was already a major financial district stretching between Cambie and Hornby. Many of the buildings here are constructed in a style known as the temple bank style. It is the symbol of prosperity, solidity, and strength and originated in eastern North America. Major buildings that were constructed in the early 1900s include the Morris J. Work Centre for Dialogue, Royal Bank Building, Birks Building, and others. Some were constructed in the temple bank style while others in the Italian Renaissance and Neo-Classical style. Today, there are hundreds of buildings in the Vancouver Financial District, including skyscrapers and major office buildings. Examples include the Scotia Tower, Fairmont Hotel Vancouver, Hyatt Regency Vancouver, One Wall Centre, and Harbour Centre, among others. The Harbour Centre, for example, is a skyscraper and one of the tallest buildings in the city. The building consists of 28 storeys and features glass elevators. Park Place is also a skyscraper located in the Financial District and one of the tallest in Vancouver. Built in 1984, Park Place has 35 storeys and features an amphitheater, water facilities, and a green space. The façade of the building is made using pink granite which beautifully matches the copper-glazed buildings. Tenants worth mentioning include the Consulate General of Brazil, Finning International, RBC Capital Markets, PI Financial, and others. The Pacific Centre is also located here and is the home to major stores and chains such as Nordstrom, H&M, Harry Rosen, Holt Renfrew, and many others. In fact, this is the largest mall in central Vancouver, conveniently located to public transport and major buildings, including the Four Seasons Hotel, 2 SkyTrain stations, the Vancouver Centre Mall as well as Hudson’s Bay. Other notable buildings in the district include the Electra Building, Bentall Centre, Cathedral Place, Fairmont Pacific Rim, and many others. Burrard Street is a major street that passes through the Financial District and is the major thoroughfare of downtown Vancouver. A number of key buildings are located here, including the St. Paul’s Hospital, the Marine Building, the Electra Building, and others. The area is served by the metropolitan rail SkyTrain situated right at the intersection of Dunsmuir and Melville St. Georgia St is also a major thoroughfare lined with key buildings and landmarks such as the Canada Post Headquarters, Vancouver Art Gallery, and Living Shangri-La, which is the city’s tallest building. Landmarks in the area include the magnificent Law Courts Building, Christ Church Cathedral, Sinclair Centre, and others. Other landmarks in downtown Vancouver are the Victory Square Cenotaph and the Vancouver Lookout which offers a magnificent view of the city. Downtown Vancouver is more of an area for clubbing, leisure, and work, boosting a vibrant night life. Housing is limited to high rises, but there are accommodations for people with a very low income, as well as mid-range and top-end hotels. You will find a few hostels as well. Vancouver is the home to plenty of fancy coffee shops to have a cup of tea or coffee with friends. Many are located downtown and feature ambient atmosphere and a rich selection of beverages, sweats, gourmet bonbons and chocolates, and a lot more. Conveniently located at Helmcken and Burrard, Elysian features a brunch menu and a selection of beverages, including hot chocolate, mocha, latte, cappuccino, Americano, and expresso. Customers are offered a selection of tasty sandwiches such as vegetarian, ham and gruyere, grilled cheese, and turkey croissant. You are free to choose your own toppings. This coffee shop is located on West Broadway and features a large communal table, small tables, and a big painted mural. Coffee is served in beautiful handmade mugs. The coffee chop offers catering and features sandwiches, toasts, smoothies, and bowls. If you are a vegetarian, you can try the Portobello sandwich with balsamic dressing, salsa, greens, goat cheese, roasted red pepper, and artichoke. If you prefer to have something with meat, pulled pork is an excellent choice. It is served with salsa fresca, chipotle aioli, BBQ jackfruit, and red cabbage slaw. Located in the Library District, Medina café is also a great choice for a quick brunch or a coffee and liege style waffle. Waffles are delicious and come with a selection of toppings, including maple syrup, passionfruit, mixed berry compote, fig orange marmalade, and raspberry caramel. The menu also features tasty meals, both meat and vegetarian friendly options. You can have flatiron steak with seasonal greens, goat cheese, caramelized onion or sunny eggs. If you prefer a veggie meal, try the avocado toast with tomato salsa, olive oil, avocado, and grilled focaccia. Medina Café also offers a wide selection of coffees, including latte, cappuccino, cold brew, brewed coffee, and more. A great coffee shop in Vancouver, their coffee is made from dry roasted beans and comes with spice, cinnamon, and chocolate flavors. Their French pastries аre freshly baked and contain healthy ingredients. The menu features soups, quiches, and sandwiches. You can try avocado and mozzarella, for example, served with lemon aioli, tomato, red onion, and sprouts. Thierry also features a daily selection of soups. You can also choose from quiche and soup combo or half sandwich and soup combo. Cold and hot beverages are offered, including house pressed orange juice and lemonade, raspberry lemonade, Spanish latte, Americano, expresso macchiato, and a lot more. This is a great place to have a flavorful latte with a homemade pastry. The menu features seasonal items such as apple pie croissant, rosemary plum Bostock, and pumpkin pie. 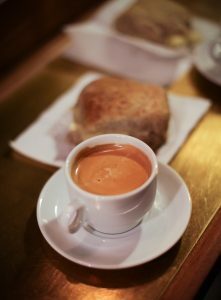 You can have an almond croissant or tropical scone with your morning coffee. Conveniently situated on Main Street, Dalina is the perfect choice for a coffee break or brunch. Meals and snacks are made using fresh ingredients, and their coffee is just great. In fact, visitors have the chance to taste Italian-inspired coffee and house made meals. Loafe Café is situated on University Blvd and features a selection of drinks and food items. The menu includes seasonal salads, tasty soups, gourmet sandwiches, and a lot more. University of British Columbia alumni are offered a 10 percent discount.